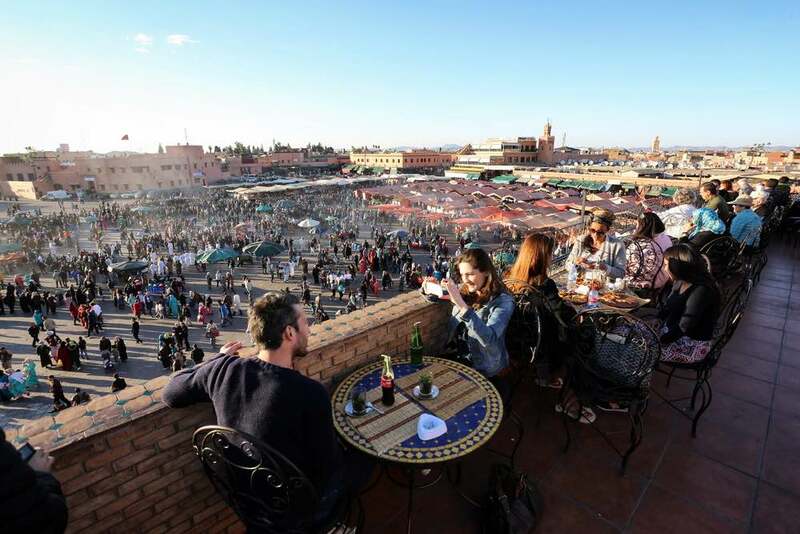 Book your next holiday to Marrakech, take part in many fun activities, shop in one of the world’s most famous marketplaces in the Medina, meet very friendly locals, and discover a land that has been around for thousands of years! 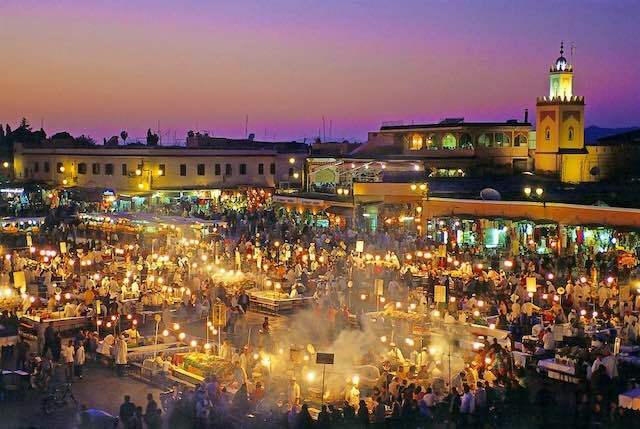 One of the most fabulous cities on earth, Marrakech has stood the test of time for almost a thousand years. The city is woven in rich history and culture that is awesome to behold. Marrakech is a wonderful blend of many cultures, towering minarets, and red sandstone buildings. Marrakech is one of the most popular destinations for tourists worldwide. The city is also known as the Red City, due to its enormous red sandstone walls that surround the entire city. Marrakech has been attracting visitors since the 1960s enticing the senses of all who come by and visit its famous souks or markets. The markets are a festivity of Kaleidoscopic colours and exhilarating sounds as vendors weave through the packed stalls showing off their rich spices, beautiful woven rugs, and countless exotic goods. Sweet scents fill the air as haggling voices rise and vendors draw you to their market with welcoming cries. You can not travel throughout this city for more than a few minutes without discovering one of their many massive architectural wonders. Discover breathtaking gardens, the beautifully carved archways, and mosques ornately draped in artistic brilliance. A trip to Marrakech is not complete until you visit the Medina which is a UNESCO World Heritage Center with its incredible blend of Amazigh, Arabic, and Moorish architecture. Marrakech has an exciting blend of cultures and entertainment. Jemaa El-Fnaa has got to be one of the busiest squares in all of Africa. Discover belly dancers, fire-eaters, acrobats, and everything else in between. Walk the streets and discover the most engaging entertainment you will ever encounter. This International Festival draws personalities from around the world including Susan Sarandon and Martin Scorsese. Best part, you can enter the festival for free by registering online! This wonderful festival should not be missed because it offers the best of what Marrakech is all about. Berber music, folk dancers, street performers, and many other entertainers for your delight. The festival is held at the incredible ruins of Badi Palace. This festival has foreign musicians offering different styles of music and runs for 5 days. This is the music lovers Utopia! If car racing excites you, this is for you! This event is just one stage of the World Touring Car Championship and the only one in Africa. There are 140 super cars racing through the streets of Marrakech, shutting down portions of the city for days on end. This is a super electrical rush! You can book flights to Marrakech from Gatwick, Stansted, Manchester, Glasgow, Birmingham, Dublin, Bristol, and Luton. 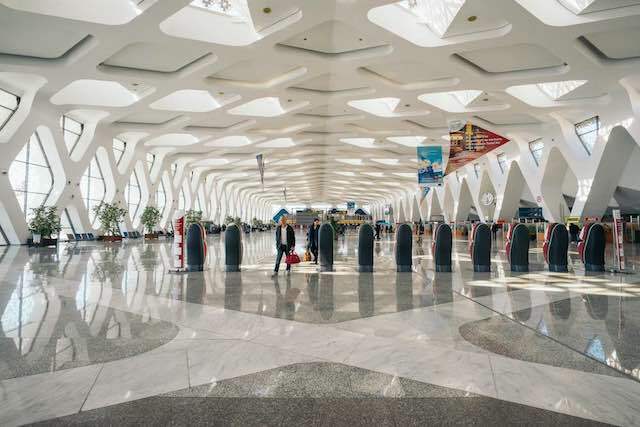 The best part, these flight will only take 4 hours to arrive at Marrakech Menara Airport which is only 4 miles from the city Getting transportation to the city is also incredibly easy. Taxis are available morning, noon, and night and are very affordable. There is a bus service that runs every half-hour to and from Medina. 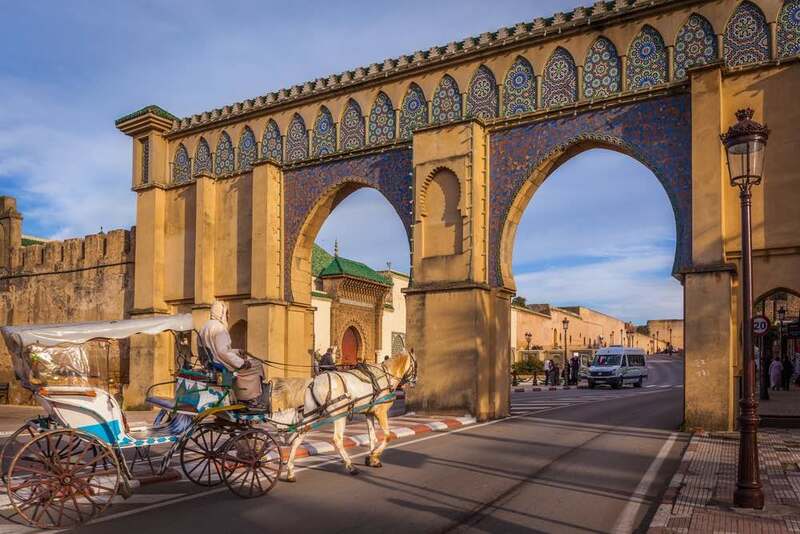 Marrakech is linked with transportation to the rest of Morocco so if you are in Casablanca or Agadir, you can get a direct flight into Marrakech. When you visit Marrakech, you will discover many wonderful places to hang your hat. The hotels range from rates for those on a budget to luxury with outdoor swimming pools, rooftop restaurants to enjoy incredible views of the city. Guests also receive many amazing amenities for their comfort. 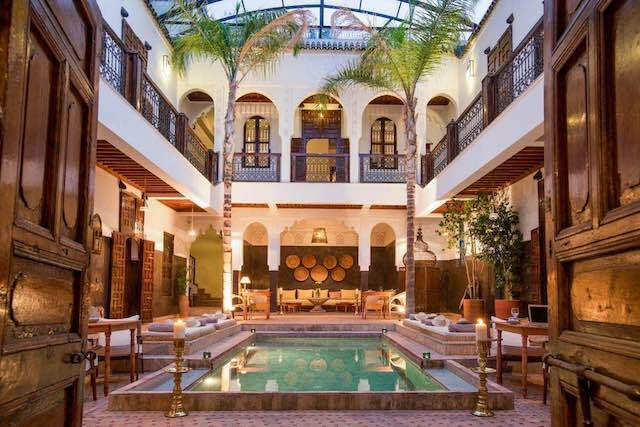 For even greater comfort, I highly recommend you stay at a Riad, which is a luxury home with a courtyard, beautiful trees, and a magnificent fountain. Staying at a Riad will allow you to truly experience Moroccan culture and there are literally hundreds to choose from. Marrakech has been visited by Kings, Presidents, Prime Ministers, and many well-known celebrities. Luxury is never in short supply when looking for a place to rest your head. If you want a really unique experience, stay in a palace during your stay. You can choose from historic places or those that have only been around for a few years. Your stay will be like an oasis of tranquillity tucked away from the hustle and bustle of the city. Enjoy gorgeous rooms, delicious cuisine, swimming pools, hammams, and other incredible luxuries. Marrakech offers some of the very finest retreats in the world and were popular spots for the hippies in the sixties. These retreats were visited by the Rolling Stones, the Beatles, and Led Zeppelin, to name a few. Retreats are precisely that, a place to retreat from a busy day. Visitors can relax, become refreshed, and energized for a new day. Many of the city’s Riads provide pools to lounge by or enjoy a drink on the roof and take in amazing views of the city and Atlas Mountains. Retreats offer spa treatments, a detox program or a total yoga experience! When in Marrakech, there will be no stress! This wonderful, vibrant city has something to offer everyone around every corner. You can visit a number of galleries or take in the theatre. Stop by Jemaa El-Fnaa square and marketplace, located in the Medina quarter. This is Marrakech’s main square visited by locals and tourists alike, year round. Watch artists apply their crafts, dancers swirl, and musicians entertaining everyone with wonderful tunes. Marrakech is an amazing Islamic city influenced by Amazigh and Arab cultures and recently offers many Western-style hotels and golf courses. To really take in the culture, visit one of their many hammams which are bathhouses or visit one of their traditional mosques. 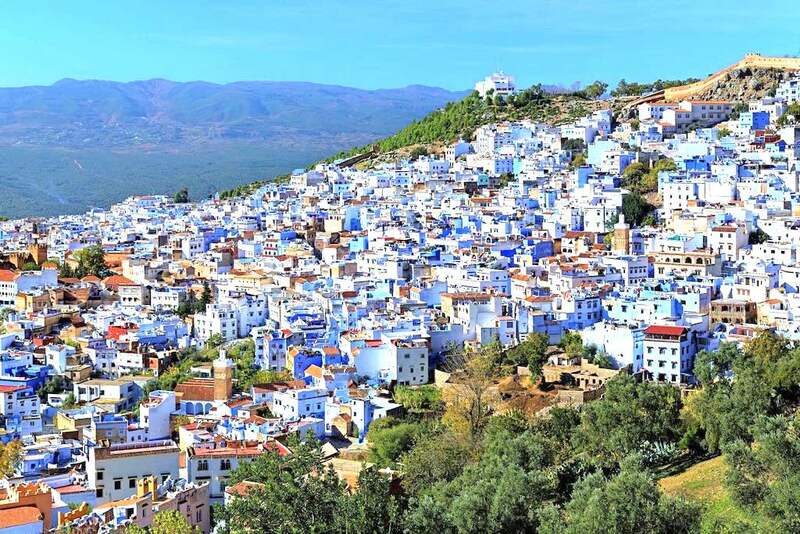 You will find Moroccan culture enchanting. You and your children will love viewing the city as you sit in an open-top bus! The buses tour throughout the city and all you have to do is jump on and jump off! Another wonderful attraction you will all enjoy is the breathtaking Majorelle Gardens with its soothing, peaceful atmosphere. Your children will love to explore the gardens while enjoying wonderful shade from huge palm trees. One of the most popular attractions for you and your children is the Oasiria Water Park! Activities are galore with an outdoor aqua centre that houses two large pools, a wave machine, children’s pools, a lazy river, and three huge slides. You will discover how quickly your day will go by with all these fun attractions! 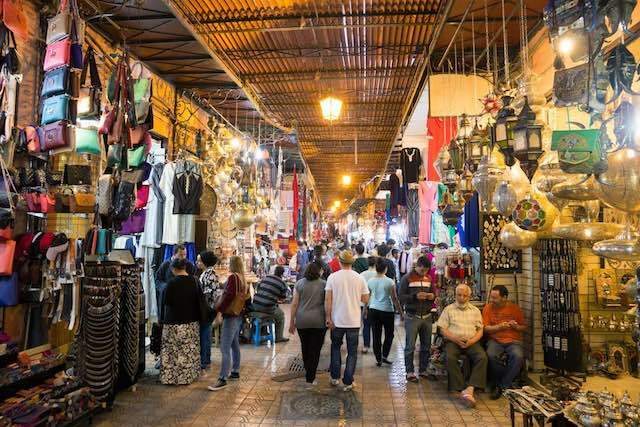 If you are a shopping hound, you will find everything you could possibly wish for in Marrakech. Visit the souks, or marketplaces, in the Medina. Wander through the mazes of stalls and discover something very special just for you. 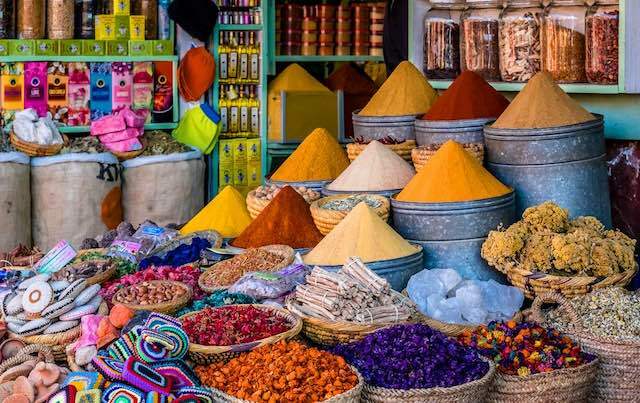 Peruse spice stalls with wonderful coloured powders, visit Morocco’s famous babouche (slippers) stalls and discover a rainbow of colours to choose from. Wander through vendors offering the finest quality carpets, jewellery, and leather goods. If you pride yourself on bartering, test your skills and get an even better deal. This area is a shopper’s paradise! Marrakech is rich in culture from the Muslim world that has existed for centuries. Occupied by the Amazigh, Arabs, Moors, and French, their cultures exist on at every street corner. 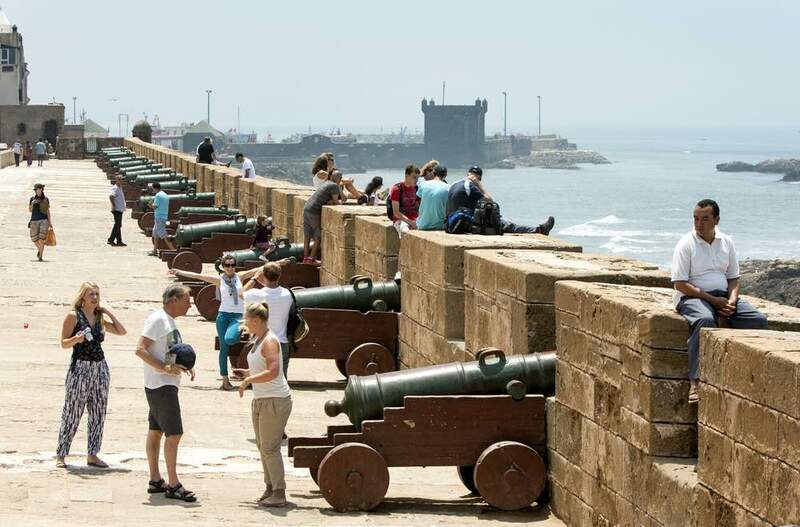 A must visit is the Medina with its massive red sandstone walls. This is a UNESCO heritage site that houses amazing mosques, riads, and many other impressive buildings. Stop by the Minaret, which is the tallest building in the city or the Koutoubia Mosque. Discover 11th and 12th-century Almoravid monuments, 16th-century Saadian palaces, tombs, and so much more. Indulge yourself in these wonderful Islamic bathhouses that are very much like Swedish saunas. Enjoy tons of steam, hot and cold treatments, or get a black soap massage that removes dead skin. There are many hammams around the city and located on the grounds of the more expensive hotels and riads. If you prefer a more traditional style, visit the hammams in Medina. Take some time out of your busy day trips and enjoy wonderful traditional foods and drinks. 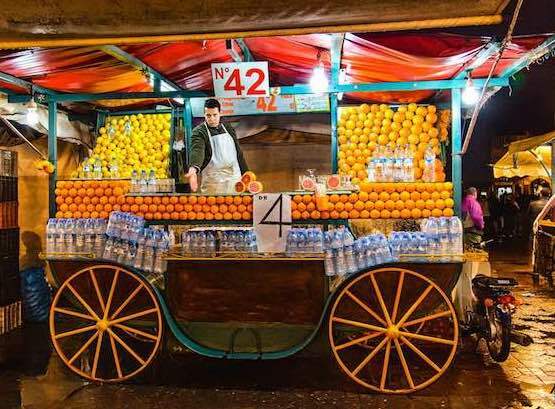 During the day while in Jemaa El-Fnaa, visit stalls that offer freshly squeezed orange or grapefruit juices or enjoy fresh dates and oranges. For a more unique experience, stop by at night when the air is filled with the wonderful scents of good being prepared on grills and over open fires. For a more traditional atmosphere, there are many restaurants and cafes to sit back, enjoy a great meal and just relax. Restaurants and cafes line the edges of the square or alleys, in hotels, and even in people’s homes. Prices vary but even the most high-end places are very reasonable in comparison to European eateries. For the more active tourists, enjoy a day rafting or kayaking. As Marrakech is located near the Atlas Mountains, you will enjoy beautiful warm waters and Morocco’s beautiful climate. The Ourika River flows from the mountains down through the valley which is perfect for your kayaking adventures. You will be engulfed in this beautiful, unspoiled surrounding as you paddle through breathtaking scenery. Discover red cliffs rising up on either side and take in their splendid waterfalls. If rafting is more your style, visit the Ahansal River which offers very powerful currents that will quickly carry you past towering cliffs, amazing waterfalls, and small villages. The scenery is breathtaking while experiencing this extremely remote and untouched paradise. You will have a very thrilling day of white water rafting while you travel down through the mountains. Marrakech has several companies that provide rafting trips. You will have your own guide who is very experienced and friendly. You will be provided with the very best service and they will ensure you are always safe. A visit to Marrakech is incomplete if you do not wander outside the city and discover the countryside that surrounds it. 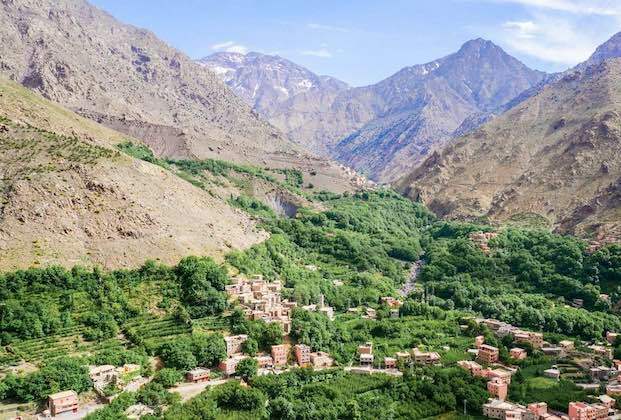 Rent a car and within one-hour, you will be exploring the many peaks of the Atlas Mountains. If that’s not quite for you, travel south to the Sahara which is the world’s largest subtropical desert. You will become enchanted by both of these are very unique places and leave with memories that will last a lifetime. If you prefer not to drive, sign up with one of Marrakech’s official tour groups. Their very experienced, friendly tour guides will arrange every aspect of the tour and will tailor your tour to your taste, your fitness level, and the amount of time you wish the tour to last. The next time you are planning your holiday, look no further than Marrakech! There is so much to see, experience, and enjoy in this very enchanted city. Whether you want a holiday filled with adventure or looking for some quality R and R, this is your calling card. Reside in the highest of luxury accommodations or a retreat to practice yoga, it’s all here!